From picturesque crags within steep-sided inland valleys, to scenic and exposed multi-pitch sea cliffs routes, and freeing deep water solos on the edge of coastal sea caves, the Maltese Islands host a vast selection of awe-inspiring crags. 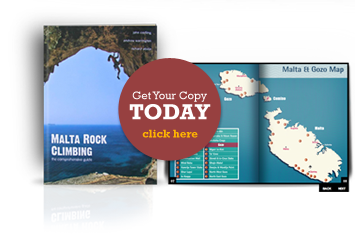 Malta Rock Climbing the comprehensive guide is a 384-page catalogue of climbs; the first comprehensive guidebook published for the Maltese Islands. 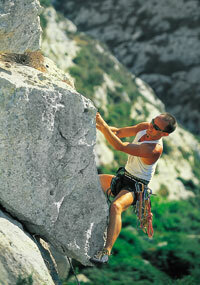 It details more than 1200 climbs and 21 climbing areas, on the 3 islands. Though the climbing here dates back to World War II, Malta, Gozo and Comino have only more recently been discovered as a magnificent playground of rock for traveling climbers from around the world. The guide is fully illustrated, with colour photo-topos and an array of captivating action photos. Detailed road and area maps show access to crags which may often be remote, and bringing you to parking areas usually less than 15mins from the climbs. The climbs are not only depicted using both route markings and detailed route descriptions but grades, heights and star ratings provide a holistic picture.